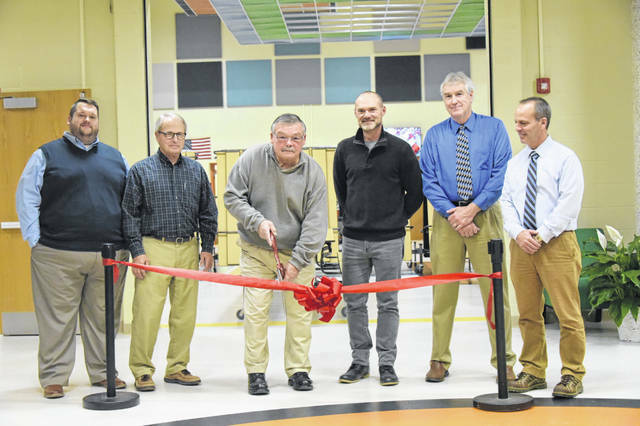 From left, WL-S board members Tim Lamb, Steve Lapp, Chuck Buck, Pat Adams, Dave Cline and Chris Moell cut the ribbon in the main entrance to the new and renovated preK-12 building. WEST LIBERTY – On Nov. 27, the West Liberty-Salem Local School District Board of Education dedicated the new and renovated K-12 building. A bond levy was passed by voters in August of 2013 and construction began in the spring of 2015. The 2 ½-year project maintained and upgraded the building, which was constructed in 1988, and it added approximately 23,000 square feet of new elementary classrooms and high school science wing. Superintendent Kraig Hissong said much time and effort went into planning how the district could solve many of the maintenance and educational needs it was facing prior to the OFCC (Ohio Facility Construction Commission) project. He said the work involved collaboration with many parts of the community and local businesses that supported the levy and provided input on the design. Also addressed was reprogramming of approximately 70,000 square feet of classroom space that enlarged many classrooms and provided new technology infrastructure that support future network demands. The project provided many new site improvements. A new second drive provides improved access to the school site and a new parent and bus drop-off area provides safer drop-offs of students. During the dedication, Hissong thanked everyone who helped make the project a reality. The dedication was attended by school district staff, community members, OFCC state representatives, the architectural firm, OHM, and construction manager, Ruscilli Construction.